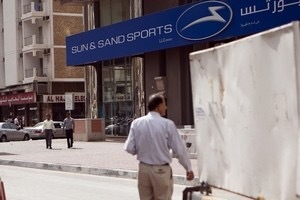 The sports apparel retailer Sun & Sand will next year add a further 20 stores in the UAE as it expands across the region. The retailer, which runs more than 100 stores in the Emirates, also operates outlets for sub-brands such as Nike and Timberland. Gulf Marketing Group (GMG), the parent of Sun & Sand Sports, embarked on a period of unprecedented expansion last year, with more than 40 store openings across the Arabian Gulf. Sixty new outlets are planned for next year, mainly in Saudi Arabia. The expansion drive comes even as retail sales in the UAE have shown a marked softening this year as a stronger US dollar and a drop in the number of Russian visitors weigh on demand. While Sun & Sand reports 5 per cent year-on-year growth in like-for-like sales this year across its stores, its distribution partners have reported falls of up to 10 per cent. “It’s not a situation I see changing over the next year,” said Miquel Pancorbo, president of the sports division at GMG. He said that increasing rental rates at malls were also putting pressure on margins and that mall operators were “disconnected” from the realities in the market. Representatives of MoE and The Dubai Mall could not be reached for comment. The Dubai-based multi-brand Landmark Group is also pushing ahead with the expansion of it Sportsone-branded outlets. It began in 2012 but now has 18 outlets with another 10 planned for next year across the UAE and the region. Global sales of sports apparel and footwear stood at US$270 billion last year, jumping 42 per cent over the past seven years, according to Morgan Stanley. It forecasts average annual sales growth of 5 per cent during the next five years, driven by growth in eastern Europe, the Middle East and Africa. Sports footwear guarantees a steady steam of customers of all ages, types and nationalities and the Mena region is fast becoming an important geography for the brands that want to become recognised. New Balance is one such brand. It had global sales of $3.3bn last year but Mena accounted for almost nothing said Darren Tucker, New Balance’s vice president. Posted on December 6, 2015, in Other. Bookmark the permalink. Leave a comment.